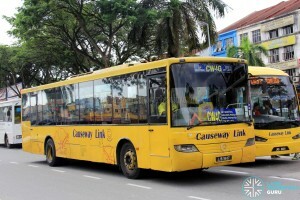 Causeway Link CW4 is a cross-border service operated by Malaysian bus operator Handal Indah, plying between Jurong East Interchange and the town of Pontian in Johor, Malaysia, via Tuas Second Link, Gelang Patah and Pekan Nanas. CW4 has multiple duplicating route variants, namely Service 52T and CW4G. Fare Section fare payment, ManjaLink Card accepted. See published schedule for details. 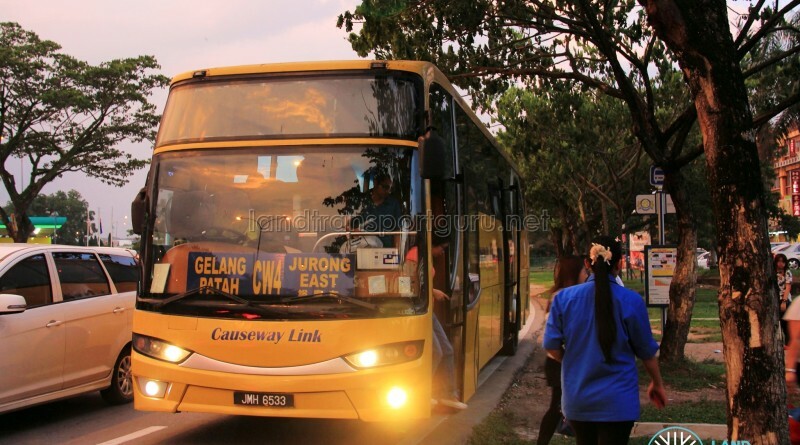 Service CW4 is a cross-border route connecting the Pontian, Pekan Nanas and Gelang Patah areas (within Johor) with Jurong East Bus Interchange in Singapore, via the Tuas Second Link crossing. 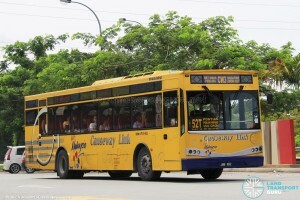 The route is one of five regular cross-border bus services operating via the Tuas Second Link, along with Service CW3, CW4S, CW6 and CW7, and the longest among them, with a full route distance of 67.5km. Second Link plying CW services, inclusive of CW4, operate as a local bus while operating within Johor, hence serving at all en route bus stops. They do not stop at any bus stops in Singapore except the designated boarding point at Jurong East. Due to varying traffic conditions at the Tuas Second Link, travel times and waiting times may increase significantly when traffic congestion occurs. At each checkpoint on the Singapore and Malaysian side of the border, passengers will have to alight and clear customs before boarding the bus again. When travelling between Tuas CIQ Complex and Sultan Abu Bakar CIQ Complex (“CIQ 2nd Link”) in either direction, commuters may board any Causeway Link bus (Service CW3, CW4, CW4S, CW6, CW7) with a valid ticket. Commuters using the ManjaLink Card should tap their card upon entry. With a valid ticket at Tuas Second Link, passengers travelling towards Jurong East can similarly board CW3 and CW4S, board CW6 for Boon Lay, or board CW7 for Tuas Link. Alternatively, passengers heading towards other destinations in JB can transfer to other bus services at CIQ Second Link. Passengers arriving from Singapore may travel for free on Causeway Link’s Service 666 from GP Sentral to Larkin Sentral. The ticket or ManjaLink card must be produced on request. The transfer point is the pair of bus stops along Jalan Gelang Patah, between Persiaran Nusa Perintis and Jalan Nusa Perintis. Additionally, passengers using ManjaLink may tap their card upon boarding any GP-bound 666. A maximum fare of RM7.00 will be charged, whereby the passenger will then be allowed to transfer to any Singapore-bound CW buses for free at the Gelang Patah transfer point, by tapping their ManjaLink card on the reader when changing buses. 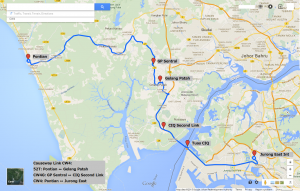 Causeway Link CW4G plies between GP Sentral and CIQ Second Link. Causeway Link CW4S will be covered in a separate article due to distinct differences. Charges section fares. ManjaLink Card payment is accepted on this bus service. Only Singapore currency is accepted when boarding the bus in Singapore, and Malaysian currency is accepted when boarding from Malaysia. Note that a fare top-up of RM4.20 at Gelang Patah is required when continuing from Singapore to Pontian. More detailed fare information for Manjalink users is attached in a separate section below. Since CW4G and 52T are not cross-border services, buses deployed may not accept ManjaLink fare payment. Commuters are advised to prepare cash fare for payment. Passengers from Singapore can take CW3/CW4G/CW4S from CIQ 2nd Link to Gelang Patah (Taman Nusa Perintis) and transfer to 52T for Pontian. 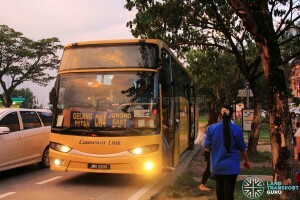 Do enquire with the bus driver when boarding the bus at CIQ 2nd Link. Timings are published as a reference and are affected by road conditions. Commuters are advised to arrive at the bus boarding point at least 10 minutes than the stated departure timing. Manjalink users will be required to tap their card upon entering the bus, which includes re-boarding the bus at the various checkpoints. As the ManjaLink card is loaded with values in Malaysian Ringgit (MYR), passengers boarding from Singapore and paying fares in Singapore Dollars (SGD) will be charged based on the prevailing exchange rate determined by ManjaLink. For example, the published ManjaLink fare for JB-bound CW4 is S$4.00, and as such when ManjaLink is used, 4.00×3.08= 12.32, thereby deducting RM12.40 from the card, as the Manjalink system rounds up the fare to the nearest 10 cents. The prevailing exchange rate for ManjaLink is regularly updated and can be found on their website.